Under pressure from the media, common people, Opposition BJP and probably President Pranab Mukherjee, Congress Vice President Rahul Gandhi has termed the ordinance on convicted politicians as “complete nonsense” and asked to tear it up and throw away, bringing much embarrassment to Prime Minister Dr. Manmohan Singh and his Cabinet. Now, it’s certain that the ordinance will be withdrawn. It was nothing but a bombshell from Rahul Gandhi, who wants to take a high moral ground and show the people that he thinks in a different manner. But, people of the country, are not very much convinced. Moreover, the latest development has exposed the differences within the government and Congress on crucial matters. Earlier, Union Minister Milind Deora too talked against the ordinance. Even, Anil Shastri had gone public with his criticism of the ordinance. The BJP called Rahul’s statement as a ‘damage control’ exercise, saying what he was doing when the government passed it and why he chose to react after so long. The Supreme Court judgement on July 10 had sought immediate disqualification of all MLAs, MLCs and MPs convicted of a criminal offence punishable with two years or more in jail. However, in a desperate bid to save Congress loyalist Lalu Prasad Yadav and convicted Rajya Sabha MP Rasheed Masood (Congress), the UPA government overruled the Supreme Court judgement and cleared an ordinance, which will give relief to these netas and also allow many other tainted politicians to retain their posts even if they are found guilty in any crime. The Union Cabinet approved the proposal to pave the way for an ordinance. Rasheed Masood was convicted in an old medical seat allotment scandal on September 19 and was in danger of losing his Rajya Sabha seat after the sentencing on October 1. The government wanted to bail them out and save all other tainted politicians. Under the Ordinance, the convicted netas won’t lose their posts, but they won’t get the voting right in the House and cannot draw salary, pending appeal in a higher court. But, the BJP, BJD, Left and the Aam Aadmi Party (AAP) have opposed the ordinance and wondered why there was a hurry to take the ordinance route. BJP leaders LK Advani, Sushma Swaraj and arun Jaitley met the President and requested him not to sign the ordinance. That forced the Congress to go on a damage control mode. “If this is nonsense, then the heads that brought this nonsense must roll. Now, it’s clear that Rahul considers the PM and his Cabinet colleagues as nonsense. The Congress wants to show that even the PM can make a mistake, but not the Gandhi family”, said BJP leader Arun Jaitley. “What was Rahul Gandhi doing for so long? He’s just trying to save the part. Any person with a little common sense would have never passed this ordinance, said Kalikesh Singh of BJD. Rahul Gandhi sochte hain iss desh ke sab log bewakoof hain. Khud hi ordinance laate ho, khud hi faadte ho. Where was Rahul Gandhi when his Govt. Passed ordinance Bill ? Is he playing a double standard game with people of India? Rahul trashes ordinance- this is how they ‘support’ their PM while he is abroad!! Forget The Good Road or The Lunchbox, Congress media/communication cell should be our official entry to Oscars. Congress trying to turn embarrassment into a virtue by giving RG credit for rebelling against ordinance. Egg on face of @PMOIndia. Rahul ji woken up after BJP leaders Sushma ji and Advani ji met President and urged him not to sign anti-constitution pro-criminal ordnance. 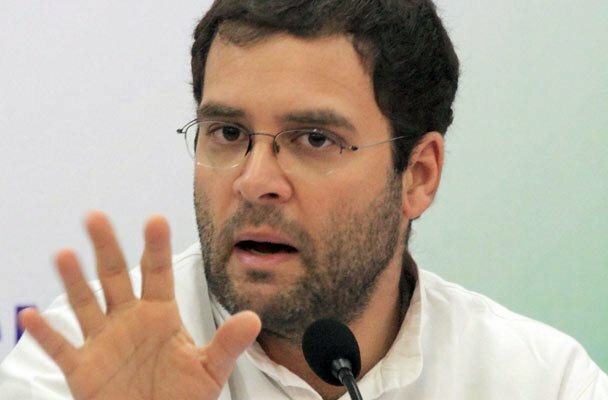 Rahul Gandhi: ordinance is nonsense. Good to hear! But Rahulji, your govt passed it!